You’re on your way to work and your phone goes ‘ding’. Your hands are all toasty and warm inside your gloves, there’s a bitter wind outside and you really can’t be bothered to mess around removing your gloves. Now you don’t need to. Instead, you can invest in some touchscreen gloves that allow you to take your phone out of your pocket and text back right away. No more awkwardly tucking your glove underneath your armpit first. No more fingers freezing up so much that you can no longer type properly. Touchscreen gloves are made from conductive material which has a low resistance when it comes to transferring electricity from your fingertips to your phone screen. This means you can activate a touchscreen through the material. There’s a whole bunch in existence – from thermal ones that allow you to use your phones as you hike up the mountain, to stylish ones more suited for urban environments. So what are the best touchscreen gloves? A lot of the choice is down to personal style preference but there are a few pointers that will help you narrow down the best ones for you. While some gloves are entirely conductive, others just have prints on the thumbs and index finger, which is sufficient for most if you plan on using your gloves solely to access your phone on the go. However, if you want to tap around on your iPad or type with your gloves on, you may want to think about fully conductive touchscreen gloves that allow you to use all your fingers. We've rounded up our pick of the best touchscreen gloves to get you started on your hunt for frost-free phone flicking. If you’re after a decent all-round pair of touchscreen gloves that you can wear on your way to work or out and about, these ones are perfect. Featuring windproof technology thanks to The North Face’s specialist Windstopper fabric, your hands will remain warm, yet free enough to carry out everyday activities easily, including answering your phone. With the conductible material incorporated in all ten digits, doing what you need to do on any smart device while keeping your hands toasty and warm will never have been easier – definitely a reason to put these North Face gloves at the top of our list. If you’re looking for an everyday glove that you can put on no matter where you’re going or what you’re doing, you can’t go wrong with this touchscreen glove from Cotswold Outdoor. Made from Polartec Power Stretch fabric, they promise warmth and freedom of movement – great if you want to transition between holding the dog’s lead to answering a call. The design of the glove has been optimised so it fits precisely – a great characteristic for a touchscreen compatible pair. You’ll find the compatibility in the finger and thumb – which is all you need, really. If you're heading to the mountains over winter, these should have you covered through some pretty, wet and cold conditions (anything extreme, go more specialist). Montane promise that the use of the Polartec Power Stretch Pro fabric will keep your hands warm and dry, while the silicone printed palm will allow you to cling onto those poles. If you’re looking for a glove that is a little more everyday wear, head back to product number one or two, but for those who like to do a little winter exploring, these are a good option as a single or underlayer and are the best touchscreen gloves for sports on our list. While the top three products have been geared towards resistance against the wear and tear of the everyday, these driving gloves should really be saved for – well, driving, and other fairly low impact activities. Made from supple lamb’s leather, Elma has ensured that these gloves remain stylish while being optimised for touchscreen use; whether that’s a smart device or your sat nav. An added bonus is the 100% pure cashmere lining, which should make them warm and snug as well as stylish – and the general consensus among the reviews is that they are. These smart leather and cotton gloves are perfect for work or special occasions. The nanotechnology within the glove works as a separate entity to mimic the conductivity of human skin, allowing for an ultra-soft cashmere lining. Mujjo has really gone to town with this glove, blending style, superior material choice and functionality to bring a glove that is as much as an accessory as a necessity. Reviews rave about the quality and the finish of the glove – just bear in mind that you are paying for it, with a high price tag. Investing in a decent pair of gloves is just as important when you’re cycling. 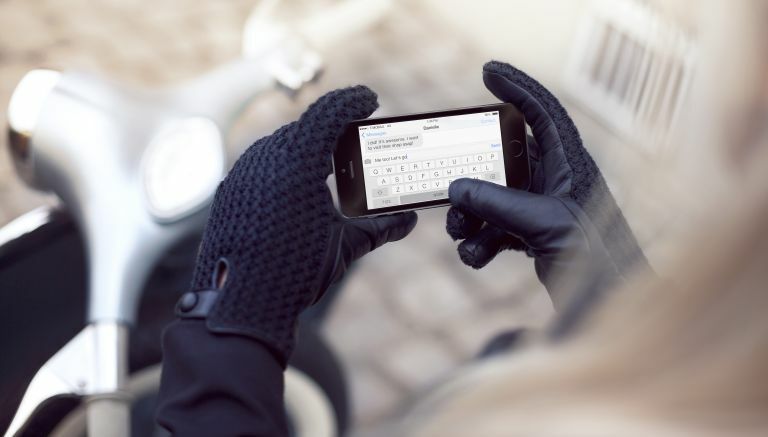 In addition to being touchscreen compatible, the design of these gloves has been optimised for autumn and spring cycling, with Northwave thinking about fabric, grip and padding so the rider’s experience is the most comfortable it can be. With even the most advanced of cyclists rating these gloves highly for how comfortable they are on the bike, the addition of the touchscreen element means that these gloves are the best touchscreen gloves for cyclists on our list. The last glove on our list combines style and material technology to bring you a garment that promises warmth, freedom of movement and the ability to send a text if you’re out and about. They’re also primed as a liner glove. too, with Arc’teryx including a clip in point for those trips that require additional layers and protection. Available in black or blue, invest in a pair that matches your everyday or your outdoor pursuit wear. These touchscreen gloves are ideal for active folk and well worth the investment if you care about style and substance.